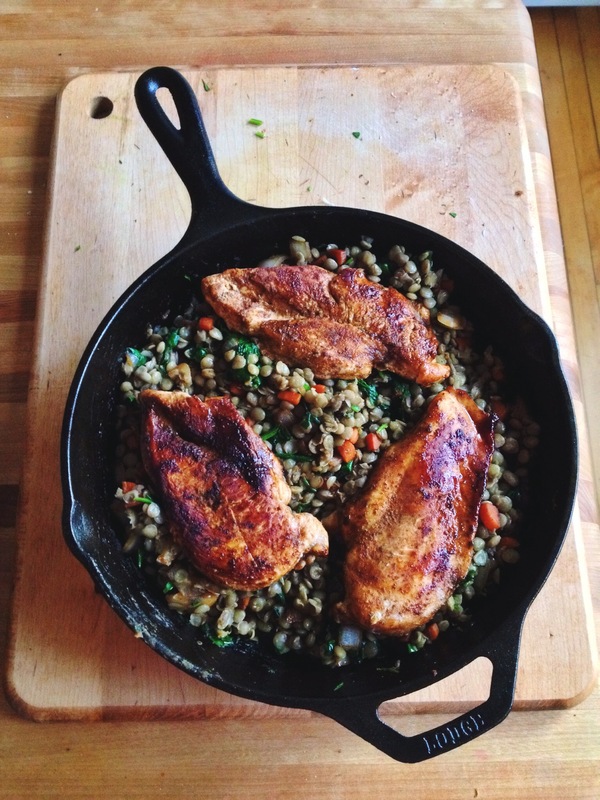 Balsamic Chicken with Sauteed Vegetables and Lentils. I believe marinades are an art, not a science. With that in mind, have a bowl or plastic bag handy and rub the chicken breasts with some spice rub and salt and pepper. Put the chicken in the bowl or bag and pour in a few teaspoons of balsamic vinegar. 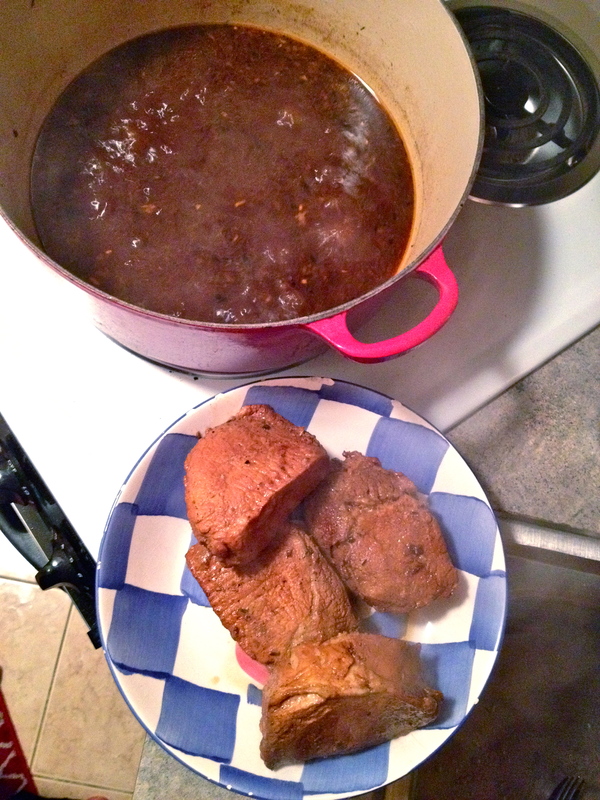 Let this concoction marinate in the fridge for at least 20 minutes, or as long as overnight. 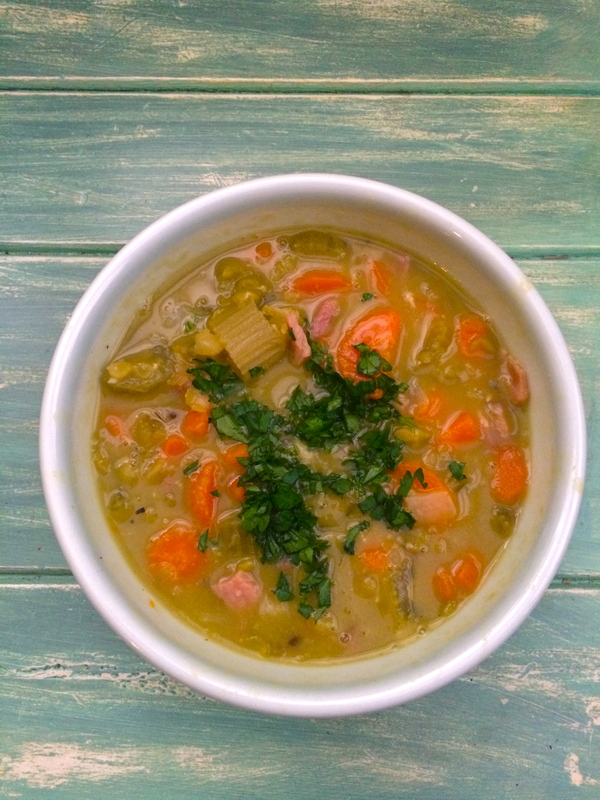 The lentils take a little while, so get them going next. Sort through and pick out any stones or weird looking ones, and rinse the remaining beauties. 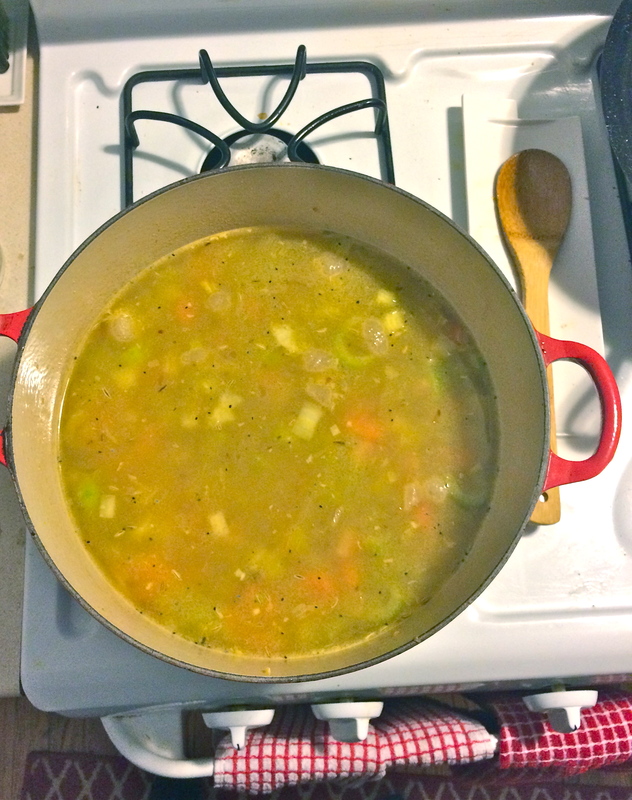 In a small pot, combine lentils, chicken stock, water, parsley, rosemary, and thyme. Bring to a boil and turn down to a simmer and cover. Cook until tender, and drain any remaining liquid. Set the lentils aside. When you’re almost ready to cook the chicken, preheat the oven to 350 F.
To cook the chicken, heat a skillet or other stove-to-oven-safe pan over medium high heat. Add some butter to the pan and let it melt, and then add the chicken breasts. I like to move each one around a little bit in the butter so that I know they’ve all had their turn in the good stuff. Make sure the chicken breasts are not touching or crowded too closely (we don’t want them to steam or braise). When one side of the chicken has browned nicely, flip the chicken over and get some color on the second side. Once you’ve got some good color on both sides, turn off the heat and finish cooking the chicken all the way through in the oven. It’s done when the center is white, not pink, and the juices run clear. 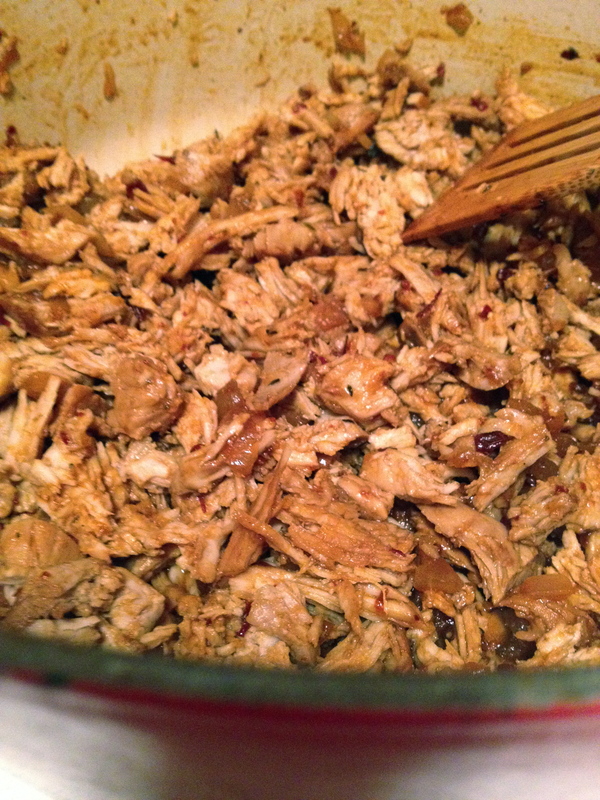 Remove from the pan and set chicken aside. But don’t do anything to that wonderful pan! It has awesome flavor in it from the chicken. So put the pan back on the stove and turn the heat to medium low. 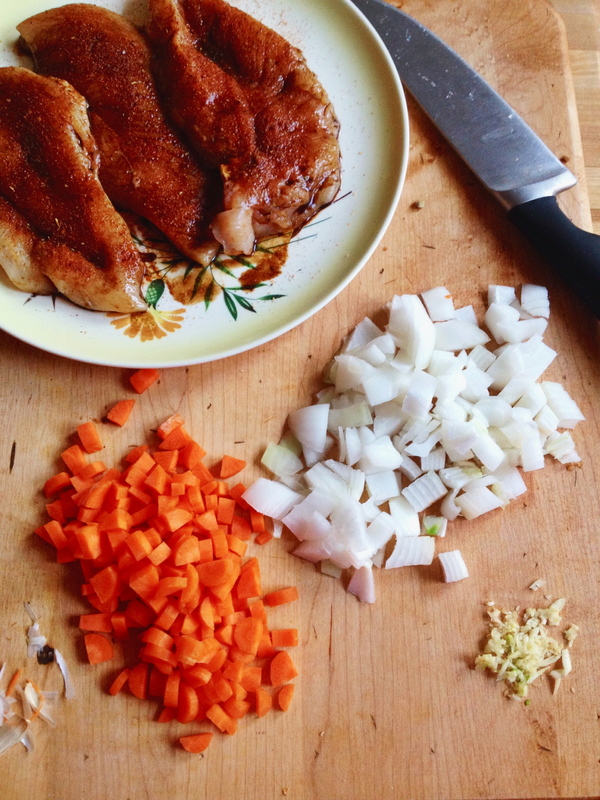 It should still be a pretty hot pan, so add the onions, carrots, and garlic, and stir around to pick up the beautiful browned bits of flavor. Cook until softened and add the spinach, cooking just until wilted. Squeeze over a bit of lemon juice if you like. 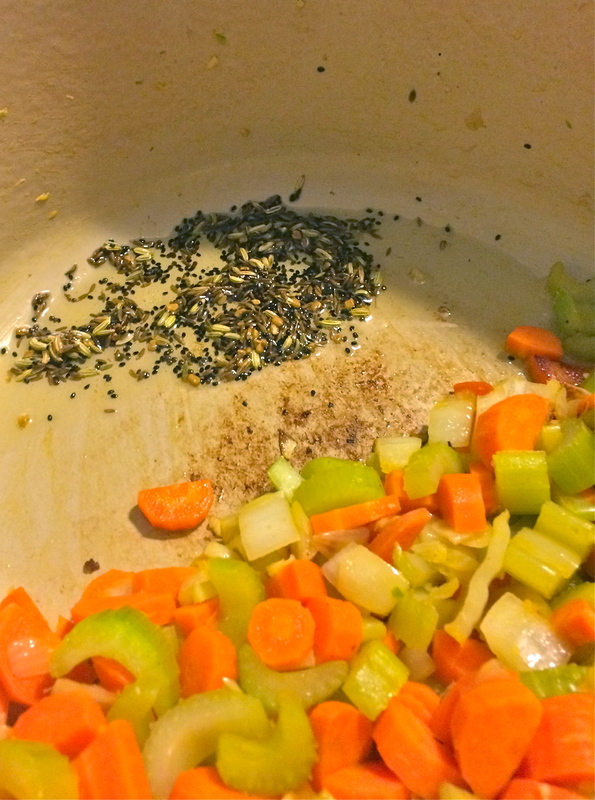 Then add the lentils into the pan and stir to create a beautiful mottled mosaic of colorful veggies. Taste for salt and pepper, and then top with your chicken breasts for a gorgeous, rustic meal! This lasted me a few days of lunches at work, and man was it good. 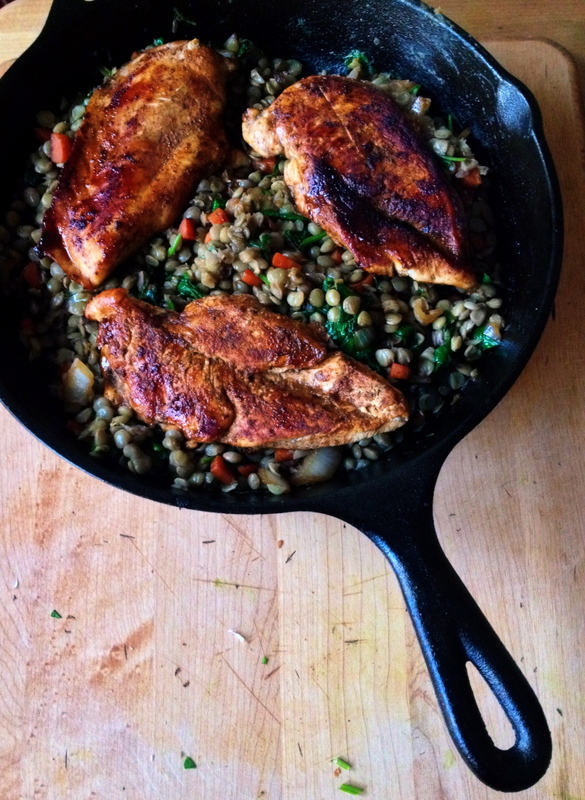 Lentils are just awesome. 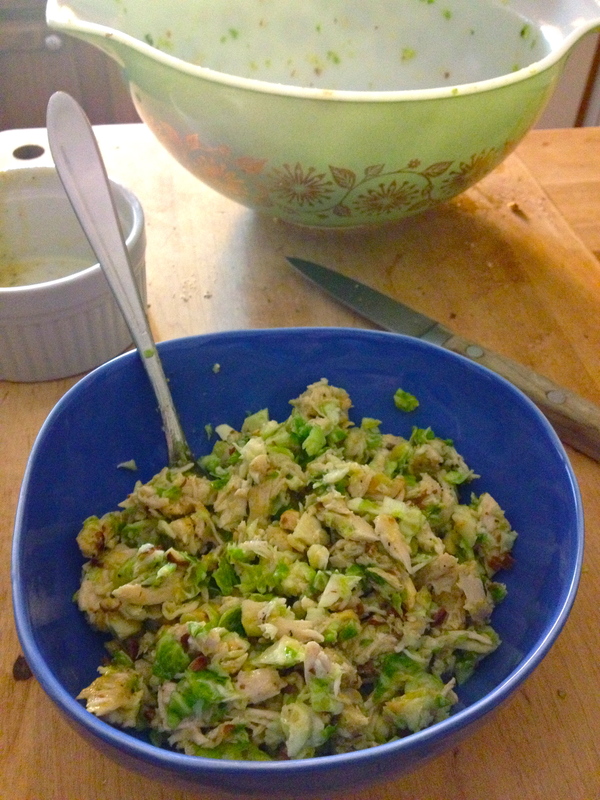 Chicken, White Bean, and Brussels Sprouts Salad. 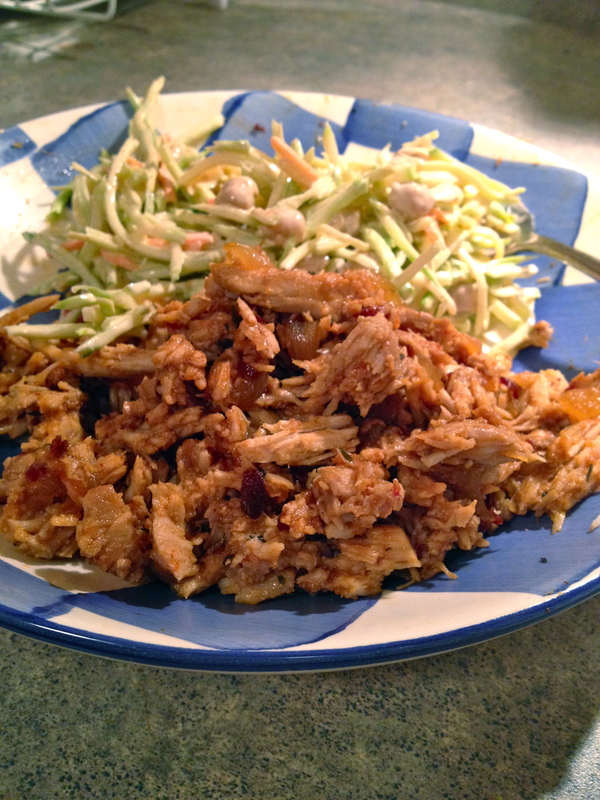 Here’s a quick and simple dinner recipe that I love to make on weeknights (you can tell from the poor lighting in my photos that I really do make this on work nights!). Shredded Brussels sprouts salads are so popular right now, but for me, they’re only really special when they check a few specific boxes: the dressing needs to have a creaminess factor, supplied by a bit of mayo here. The tart-sweet balance has to be just right – so I’ve paired apple cider vinegar with honey. And though I hate to say it, the protein must come from something other than bacon (as is so often the case with Brussels sprouts salads). 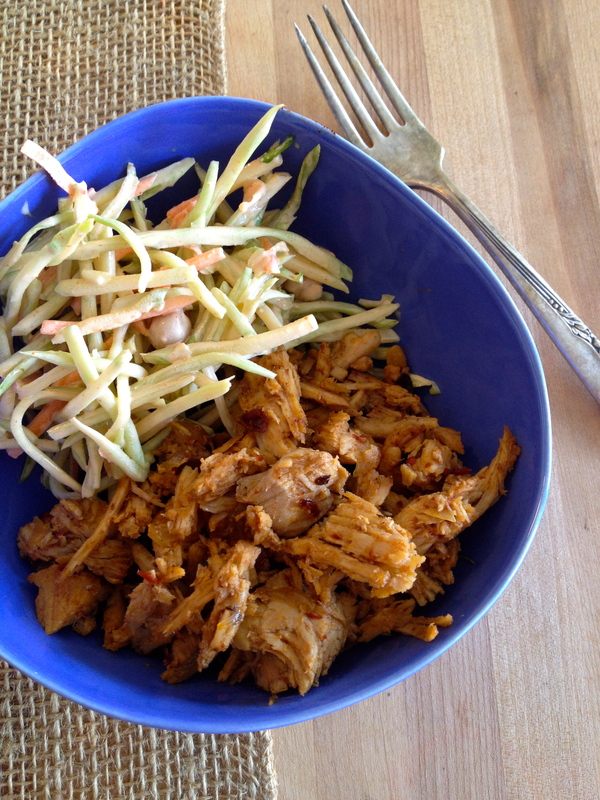 This is a dinner salad, not a side salad, so the beans and chicken are essential and so so good. Here’s how you know this is an awesome dish: I always make twice as much as I’ll need, so that I can bring the leftovers to work for lunch the next day. But once or twice I have eaten the whole thing and had to think of something else to bring for lunch. 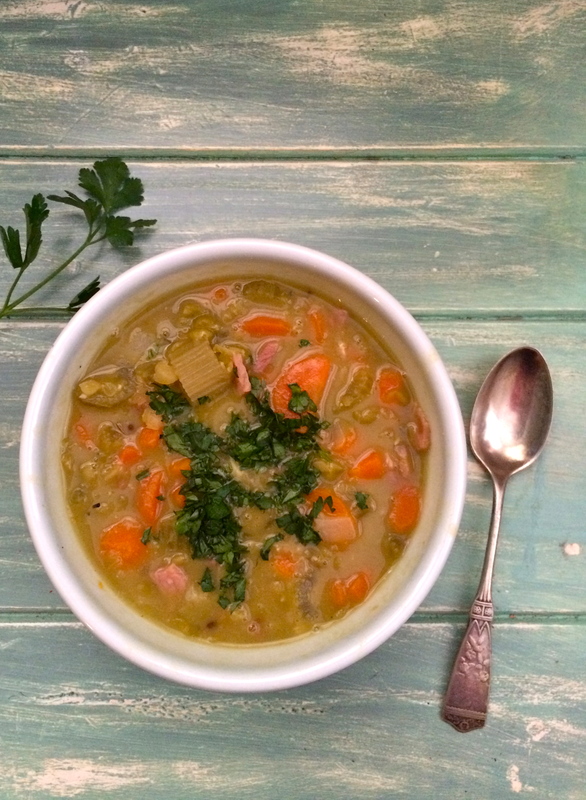 What can I say…it’s healthy and tastes fantastic! In a small bowl, stir together mayo, olive oil, garlic powder, cayenne pepper, parsley, mustard, vinegar, honey, salt, and pepper. 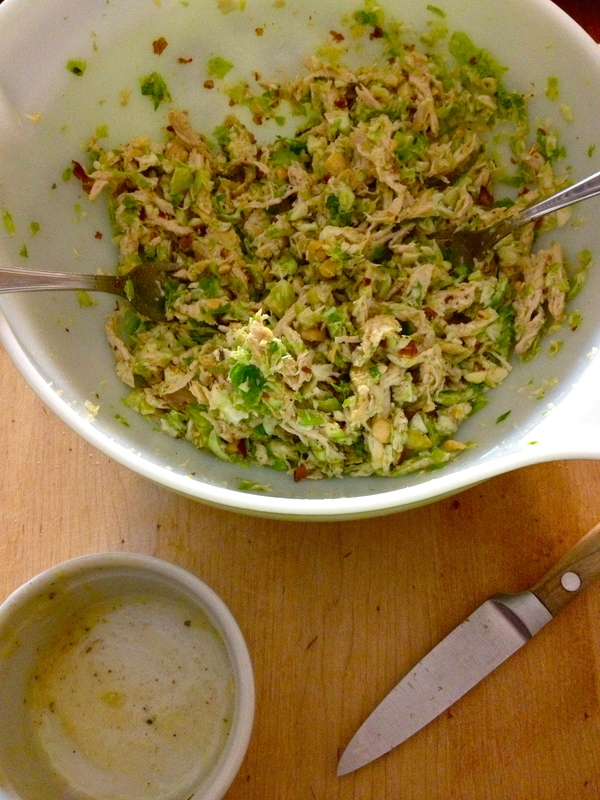 In a larger bowl, toss Brussels sprouts, beans, chicken, and almonds with dressing. C’est tout!